The concert is at 4 PM and admission is only $10. 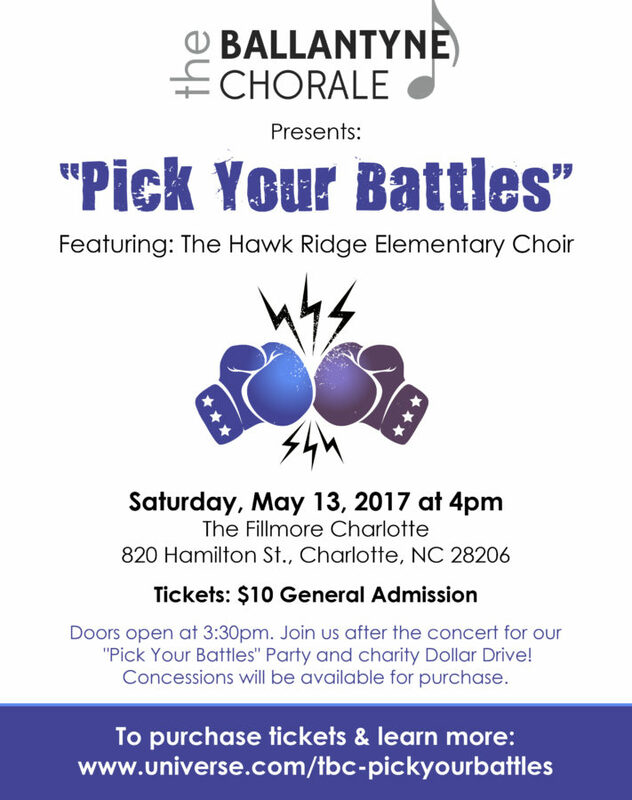 Immediately after the concert, the chorale will be hosting a “Pick Your Battles” Party and charity Dollar Drive! Concessions will be available for purchase. The party will run until 7:15 PM. Everyone is invited! Check Out Their Event Poster Below! The Ballantyne Chorale is in its 4th season. Their journey began in 2014 with 16 members, including their four co-founders: Beverly Warkulwiz, Amber Faulhaber, Julie Yakoboski, and Jane Russell. Members have ranged in age from 17 to 70 over the past four seasons, and they currently have 20 members. The Ballantyne Chorale performs around the greater Charlotte area during the holidays and presents an annual spring concert to conclude each season. For more information, check out their Facebook page by clicking here.